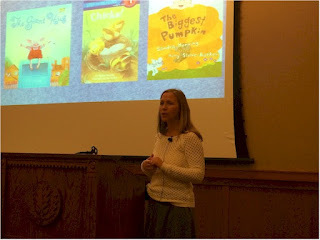 Sandra Horning, whose unique author appearances I covered last month, also presented at the Connecticut Children's Book Fair on Sunday. This was a chance to see her doing a traditional author talk, so I took it. Sandra did what she called an "inside story" on each of her three books. Here's what was fascinating about them: The same process that goes into adult work went into her work for very young readers. You know how the classic advice for writers is "write what you know?" Yeah, Sandra did that. With a Step Into Reading book. Not a lot of words there, folks, but knowledge of one of her interests went into it. The personal inspiration for her first picture book, The Giant Hug, is something you'd expect to hear for a novel. I was particularly impressed with Sandra's material on her Step Into Reading book, Chicks. The page of editorial comments illustrated that these manuscripts are treated as seriously as future National Book Award contenders. Sandra made me want to try writing one. But what about? Gail, many thanks for attending my presentation. I'm glad you enjoyed it, and pleased that the inside story on my beginning reader has inspired you to try writing one! I too find it fascinating to learn about the author writing process.